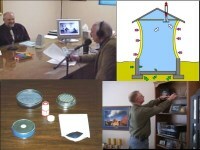 This 16 hour CE course is a popular audio course applicable for both Radon Measurement and Mitigation Professionals. Audio downloadable on MP3 player for convenient listening and online quiz and certificate generation. Sean said: Well done. Very informative and a good refresher. brian said: Two thumbs up! John said: I thought the course was very informative and helpful. Stacey said: Really enjoyed it! Timothy said: The Course was very thorough and relevant to my goal of passing the Certification Exam. Jim said: I like the way the course is set up and the ability to work on it at my own pace. Audio downloads are great. Kristin said: I really liked how in this class I felt there was more information about radon mitigation than prior classes. Wayne said: Very well presented. Richard said: This is a very informative course, both for initial and continuing education. Ronald said: The course was exactly what I needed. Cord said: The course is excellent! The review questions could be more comprehensive; it seemed like some of the questions were repetitive. Scott said: Best part of this course pertained to the guest interviews. They are very informative and I valued the information. Carl said: Lot easier log in and, previous course completions and overall usefulness of my specific information!